The biannual food trade show SIAL was held October 16-20 in Paris. It featured more than 7,000 exhibitors from 100 countries and over 400,000 products. Of course it is impossible to view or taste all of them. Innovation was again found on the floors of SIAL with 2,189 products entered for an award out of which 552 were selected by the expert juries. The trends, identified by XTC Trends and Kantar TNS, featured four main themes this year: The Essential Basics; the Eating Better or Better Eating; The Food & Sustainability and the Connected Food. Some of the sub-trends that emerge from the top themes are familiar like Nostalgia or Less Packaging. But what a journalist can observe during the 5-day largest food trade show in the world? Here are my discoveries on both trends and products alike. Surprising was the amount of products in a tube. As tubes are easy to use, portable and use less material, they have become a practical alternative to the common box or glass jar. We are all familiar with the tomato paste in a tube. Now, consumers can find everything in a tube from vegetable paste to honey and even spreadable chocolate. 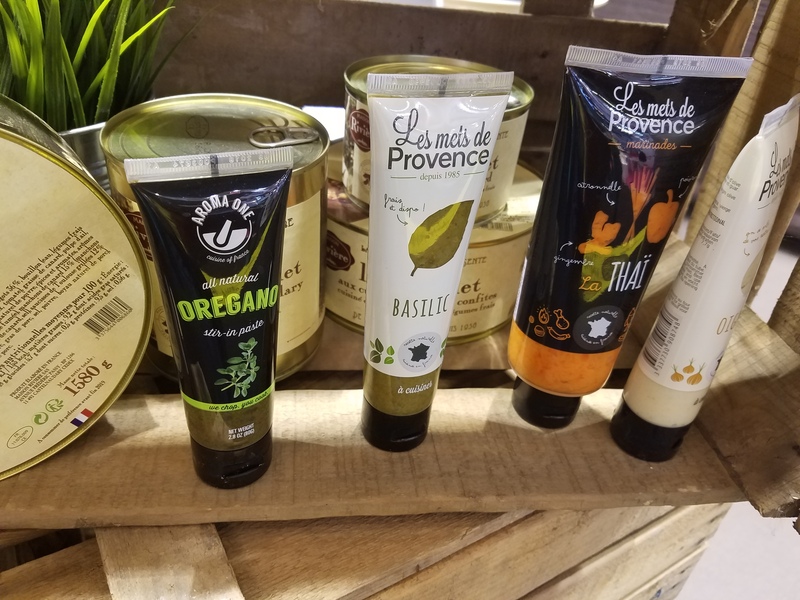 Les Mets de Provence showcased the line Les Aides Culinaires en Tube, a range of paste products in tubes including green and black tapenade, onion paste, bouquet Provencal and others. The Aroma One company has a similar line of products: herbs and spices pastes in tubes like the basil paste, dill, cilantro and chili pepper. But in a tube come also sweet flavors like the chocolate and hazelnut spread called Gianduioso from the company Pastiglie Leone in Italy. The MielTonia is another tube for sports people, an energy mix of honey and natural ingredients. Matcha mustard from Sur Les Quais is another tube invention said to be ideal for fish. Stand-up pouches are also seen in a variety of products for easy use like the Strawberry Coulis from the Fruits Rouges & Co. Microwaveable cups like the Parmetine's cup featuring small potatoes with sauce in the lid can be ready in 6 minutes and a ready to cook omelet with mushrooms in an easy to pour pouch by Truffieres de Rabasse. Another one-of-a-kind product is the Les Moulins A Champignons by Sabarot that consists of a mix of dried mushroom in a mill. This SIAL Innovation award winner is an expression of a vintage, nostalgic item, that of the pepper mill. 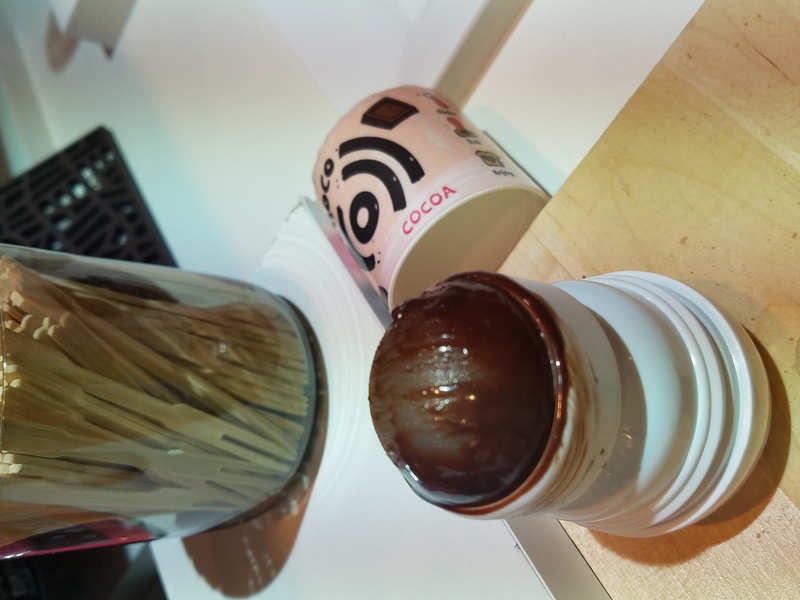 Finally, the ChocoRoll by Ornat Chocolate is a chocolate spread in a roll-on bottle. A fun way to spread your chocolate! Meat substitutes are common in the marketplace today with Germany pioneering the production volume. To satisfy the flexitarian, those who never give up meat but keep it to a minimum of once or twice a week, a new generation of meat substitutes are now available. Those are made with legumes, lentils, beans and chickpeas as well as with added green vegetables and seeds. Steaks et Boulettes de Legumineuses by Ici&La got the innovation award by SIAL this year. This substitute of meat is made with green lentil, chickpea and beans and is 100% vegetarian. In addition, Chef by Vitagermine/Vitabio is an organic vegetarian meal with sauce on the lid that features a mix of cereals and pulses with cooked vegetable sauce ready in 2 minutes. Pasta as well becomes healthier and is now available in its gluten free form made with pea protein and legumes. The Green Pea Penne and Red Lentil Fusilli by Pastificio Mennucci are said to be rich in protein and fiber. Delverde Wellness Range is a range of pasta made with selected flours as source of protein, and with chickpeas and flaxseed; not gluten free but innovative all the same. The Yellow Lentils Spaghetti is an organic and gluten free made only with yellow lentils. Pedon pulse based pasta rich in protein is called More than Pasta made with lentils, green pea and chickpea. Before seaweed was a delicacy from Asian countries. Now, it can be found in supermarkets in Europe and elsewhere. 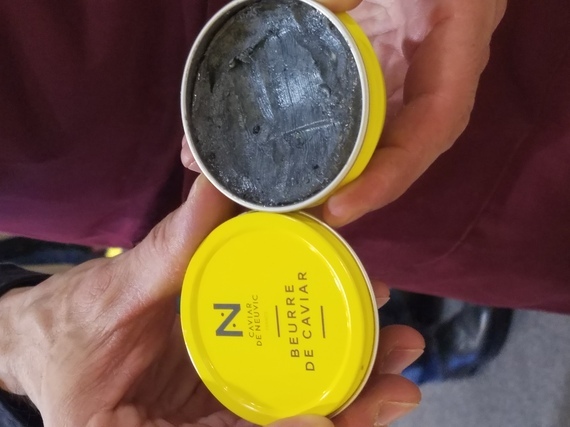 Some of the most interesting products are the following: Mon Huile aux Algues a seaweed oil, blended with grapeseed and olive oil by Croix et Nature; SIAL Innovation Award winner, the Le Bonta/Nuova Terra is an organic seaweed in a pouch available in nori, wakame sea lettuce and sea spaghetti. 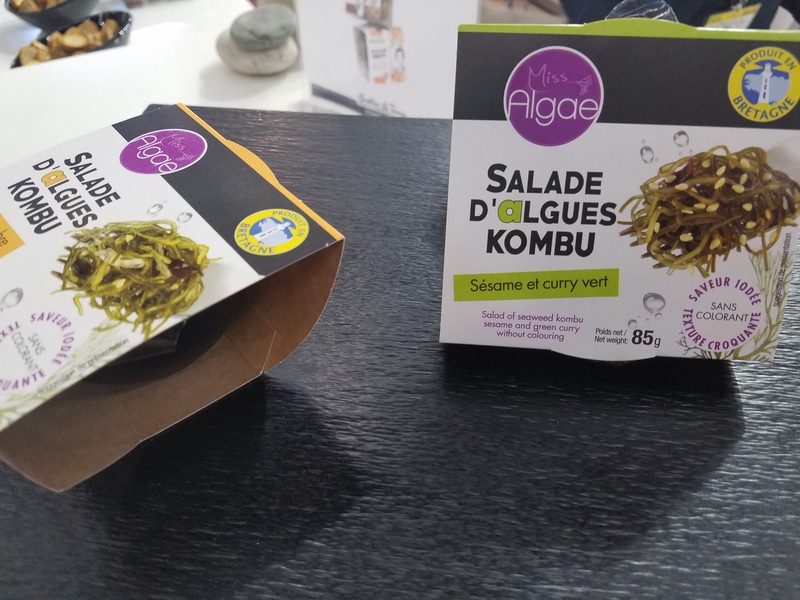 Miss Algae Seaweed Salads, individual pots of Kombu Seaweed Salad packaged with a fork are low in calories and available two flavors, ginger and sesame and green curry. Another product that draws attention is the France's Primeal Tagliatelles with Spirulina, a handmade pasta infused with spirulina for added nutritional value. Dairy products can find innovation rather difficult as there is as much you can do to make cheese, milk and yogurt. Innovation comes in packaging but also with the new trend of Mix & Match, a sub-trend of the Essential Basics. 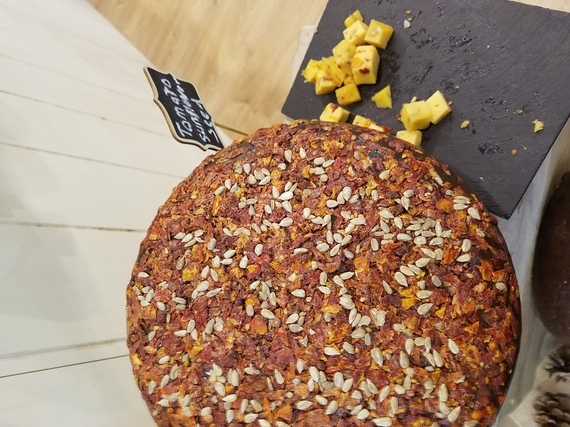 Cheese now can be mixed with interesting and often unexpected ingredients like linseed and watermelon of Greek company Polyphemus; paprika, jalapeno peppers, sun-dried tomatoes from Lithuanian cheese maker Vilvi. Or the Hay Flower Rebel Cheese, that is made with milk from hay-fed cows coated in flowers; and the Uncooked hard cheese with Leffe beer, indeed an indulgence and innovation. Another innovative cheese was the Camelicous, the one made with camel milk from the United Arab Emirates, in three types, the soft, the feta-like and the soft low fat. Also on the SIAL floor were an array of products that reflect the sub-trend of Little Pleasurable Luxuries of the Essential Basics. Extra Virgin Olive Oil Marmalade by Oro Bailen is an extra virgin olive marmalade that contains 50% olive oil, a unique delicacy; Handmade duck foie gras in brioche in a glass pot for a quick and delicious indulgence; Olive and Honey premium spread in a sophisticated pot from Arodama, a kind of one-of-a-kind honey tapenade recipe to dip in with veggies or crackers; Mini figs stuffed with foie gras for cocktails that is super delicious and amazing. SIAL is an impressive food trade show and this is why it attracts the amount of exhibitors and visitors alike. Tasting and even seeing all the products is impossible. Walking on the aisles though you can get a good idea of what is new, trendy, traditional, upcoming and extravagant. As consumers' palate and attitude evolve, innovation is the only way for products to end up in someone's pantry and not in a recyclable bin. Let's talk again in two years and see what new will be available.